Key features revealed for Nitro Games’ upcoming game, Medals of War. On this date, Nitro Games revealed the core gameplay elements of the upcoming game, Medals of War. The game takes place in Warland, a world with units, weapons, equipment and environment inspired by the actual era. Warland comes alive with explosive effects, outstanding graphics and awesome sounds! Players battle from the fields and forests, through the war torn cities all the way into the piercing cold of the North. The Player’s army is formed of several heroic units of various different types, such as Riflemen, Grenadiers and Tanks. The units have specific roles in offense and defense on the battlefield. All units are upgradeable and with different levels of experience. Collecting and upgrading various decks of top-notch units is the bread and butter of building explosive battle tactics! In the battlefield, players are matched with each other in intense PvP combat – In real-time! Players are given previously unseen control over the deployed units! The units are supported by mighty orders that can turn the tide of the battle. The most experienced players can team up with fellow commanders to form companies to take the game to the next level! 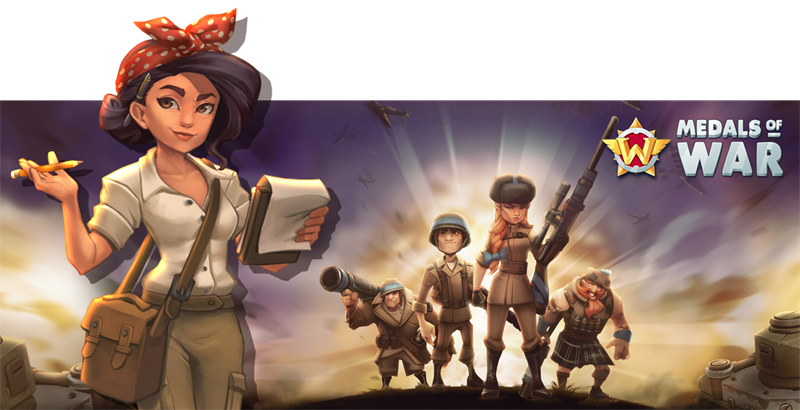 Medals of War is a community-focused game that brings players together with their friends. The aim is to level up, hone your skills to be the best commander in Warland.